Students will be able to conduct a short research project that builds knowledge about carnivorous plants. Students will be able to take brief notes about the topic. Show the first 30 seconds muted from the video titled, The Carnivorous Plant that Feasts on Mice. Ask students to give a thumbs up for YesOr thumbs down for NoIf they have ever heard of a plant that eats meat. Go over the student objective by choral reading it as a class. Explain that today’s lesson will include research. Remind students that most plants get food by a process called Photosynthesis. Photosynthesis is the process through which plants create their own food. They use water, sunlight, and carbon dioxide in the process. Point out that the plants in the video were not only relying on photosynthesis for their food. Explain that the plants in the video are considered Carnivorous. A carnivorous plant is one that eats meat. It has the ability to catch prey in order to get food. Read aloud a book about carnivorous plants, such as Hungry PlantsBy Mary Batten. Stop to point out special characteristics that set the carnivorous plants apart from more common plants. How does it catch its prey? What does the plant need in order to survive? 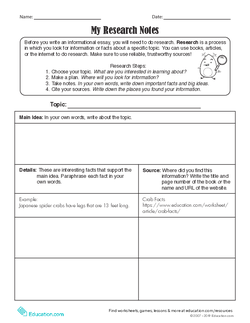 Display a copy of the My Research Notes worksheet. Explain that this is where we organise our research notes. Tell students that they will get to choose a carnivorous plant to learn more about. Explain to the class that you will model using the graphic organizer on the My Research Notes worksheet, but that you’ll also need their help picking out important information to include. Point out that the topic is going to be the type of plant being researched, such as the Venus Flytrap. Model writing a main idea about the topic. For example, "The Venus FlyTrap is a carnivorous plant because it feeds on small animals, like insects." Inform students that all other details recorded on the graphic organizer must connect back to the main idea. Show a page from the book or a webpage that includes information about the carnivorous plant. Model identifying important details to record on the My Research Notes worksheet, and have students assist in choosing information to put on the graphic organizer. 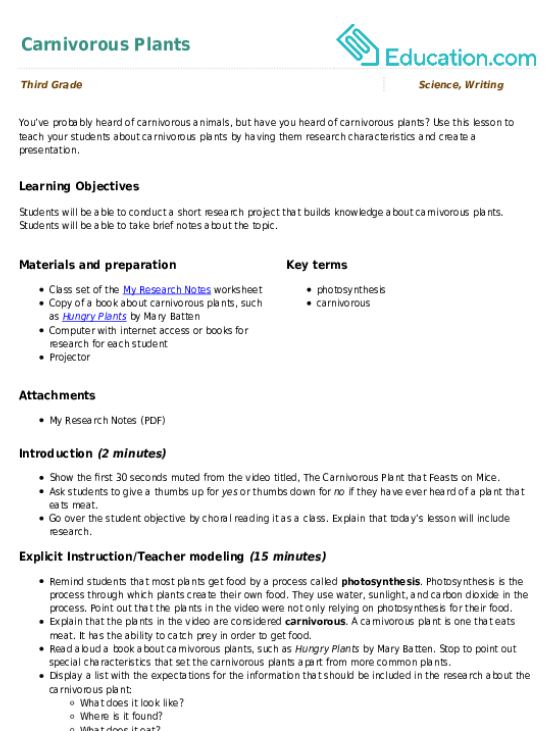 Emphasize the column on the notes graphic organizer that requires the students to cite their sources. Show them how to do this. Distribute a copy of the My Research Notes to each student. Have them pick out a carnivorous plant to research. Note that students should record their topic, a main idea, and at least five details in the allotted time. Which piece of information from this paragraph is most important? Why is this information important to include? How does this information relate to one of the research expectations? Supply printed materials for struggling students from which to gather information on their topic. Have them highlight the important information. Provide an adjusted text about carnivorous plants for struggling readers. Reduce the amount of details students must include on the My Research Notes worksheet. Have advanced students research more than one type of carnivorous plant. Challenge them to create a presentation in which they compare and contrast the two types of plants. Utilize a research rubric to assess students’ research notes about carnivorous plants. Focal points should include: main idea, supporting details, and citing sources. Instruct students to put a star next to their favorite piece of information they recorded on the My Research Notes worksheet. Call on nonvolunteers to share the piece of information about the carnivorous plant they researched. Have the class point out similarities and differences in the plants.